PERFECT POUT! LIP PLUMPER! Perfect Pout - No need for the Needle, Lip Plumper Cream is guaranteed to enhance the size of your lips! The unique formulation plumps up and increases the fullness of your lips! You will instantly begin to see the long lasting results! Your lips will become fuller and sexier, with the perfect pout! 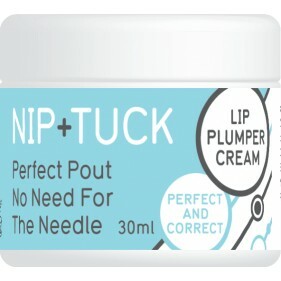 Nip and Tuck Lip Plumper cream gives your lips and instant boost. The cream is formulating using 100% safe and natural ingredients that are deeply moisturising and hydrating! Your lips will appear smooth and nourished! You will have the perfect pout! • Give lips and instant boost! • Plumps up and increases the fullness of your lips! • Deeply moisturising and nourishing!